Successfully Added Family GPS Tracker - Quad Band GSM/GPRS/SMS to your Shopping Cart. Family GPS Tracker -Dual Band GSM/GPRS/SMS, an indispensable device when your family's safety is your number one priority. This compact GPS Tracker offers peace of mind to families and others wanting to take care of their loved ones or sentimental belongings. Place one in your child's backpack or school bag in case they become lost or worse, and you'll always know where they are. It's especially useful when your children go on school trips and you can't be there to watch over them. This device also offers reassurance when you have older children and you need to confirm that they are indeed at the library doing research and not at the mall hanging out with their friends. 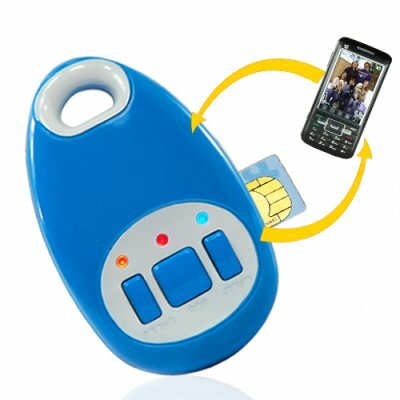 Adult children will love this device too, as it allows them to keep track of elderly parents who might easily get lost. The GPS tracker's innovative loop design means it can also be worn on a lanyard or keyring making it easy to carry or it can also hang from a pet collar so you'll never have to spend hours searching the neighborhood for your family pet. Some users even activate the continuous transmission feature so they can track their pet's movements throughout the day. Another practical use for the Family GPS Tracker is to hang it off your belt when you're hiking or trekking in a remote location. By transmitting your co-ordinates at regular intervals to a friend, you'll ensure your own safety and can focus on enjoying the great outdoors. The Family GPS Tracker is easy to setup and use. Simply insert a SIM card into the unit and power it on. Next, register your cellphone with the unit by sending a text message to the telephone number associated with the SIM card. Immediately, the GPS tracker replies with an SMS message to confirm your cellphone has been linked and also provides longitude, latitude, and speed data for the unit. Subsequently all commands to the GPS tracker are facilitated by SMS text messages from your cell phone and all tracking data is sent via SMS text messages as well to your mobile phone. All this is possible as a result of the sophisticated GPS microchip embedded into the heart of the tracker which continually reads its own location from low orbiting global satellites and then utilizes the GSM/GPRS infrastructure operated by major cellular network providers via the SIM card to transmit its current location to you. This GPS navigation device is a must-have for families where safety is a main concern. Buy one to monitor the whereabouts of your own children or pets or buy a dozen to offer your customers a security solution you can feel good about. Just another way that Chinavasion - the leader in China wholesale electronics makes life easier for our customers and resale partners. How do I make sense of the longitude and latitude data this unit provides? Both Google Maps and Google Earth can easily translate the data into usable visual information. How long does it take to recharge the battery for this unit? First use requires 8-12 hours charging time, while subsequent usage only needs 3-5 hours of recharging time.